Keep records of local and foreign loan affairs of bank financial project. Loan classification/reclassification according to lean agreement prepared by loan operation, loan recovery, loan rehabilitation, zonal and branch and law department along with proper authority’s approval. Provide information about project loan accounts to loan holder, related bank authority, departments, zonal and branch office regularly. To provide relevant accounting information to project entrepreneur, related bank department, zonal and branch office about recoverable loan installment, interest of loan etc. Keeping loan recovery statistics, submission of statistics to inform management authority and other related department. Preparation of loan statement schedule and supply that information to various department and branch office is monthly and quarterly basis. Make information about yearly loan statement and up dated loan statement to loan order. Loan account scheduling according to loan disbursement. Keep all loan accounts and submit trial balance to central accounting department in monthly basis. Re-evaluation of existing loan accounting method and correction, refurnishing and to update the methods. During FY 2004-05 the Bank made commitment of TK 327.42 million in local currency to 22 projects. During the period the Bank disbursed term loans of TK. 143.70 million in local currency to 23 projects as against the disbursement of TK. 296.96 million to 14 projects in the previous year. During the period the bank signed loan agreements with the sponsors of 10 sanctioned projects for an amount of TK. 300.95 million. During the last year the member of such projects was 15 and the loan amount was TK. 406.51 million only. The Bank intensively monitors and supervises implementation of its own financed projects. During FY 2004-05, 7 projects commenced commercial production and 48 projects were under different stages of implementation. If others, 11 projects were under construction, 10 projects completed loan agreement and 27 projects were awaiting documentation. During FY 2001-01 5 projects commenced production and 19 project ware under different stage of implementation which indicates that there in increase in implementation of projects. Loan recovery is a crucial index to measure the success of a lending organization. Like previous years, This year two, the Bank has strengthened its recovery drive for realizing loans and dues from its borrowers and significant success was relieved. Total recovery target of loans during the FY 2004-05 was Tk. 1400.00 million against which actual cash recovery was Tk. 1391.44 million constituting 99 percent of the target. During the reporting year, outstanding loan of Tk. 259.48 million was regularized through rescheduling and replacement of bad and doubtful loan accounts. The amount regularized through cash recovery and rescheduling were Tk. 1124.20 million and Tk. 14940 million respectively in FY 2003-04. During FY 2004-05, The recovery drive was affected to same extent, among others, due to the ever memorable serious flood, the country experienced. During 2004-05, the percentage of classified Loan stood at 41% with a 21% decrease over the 62% of the preceding year. In other words, with a decrease of Tk. 6359.69 million during the reporting year, the classified amount of loan stood at Tk. 3664.71 million from Tk. 10024.40 million in the previous year. The Bank initials legal actions under the BSB order, 1972 and Artho Rin Adalat Aien-2003 against those defaulting and recalcitrant borrowers who fail to come up with any satisfactory proposal for settlement of Banks dues after all normal recovery efforts have been exhausted. In FY 2004-2005, legal notices were issued against 33 defaulting companies for recovery of Banks dues while law suits were filed against 11 companies. Besides, 79 sale notices were published in the national dailies for auction At the same time efforts were made for some time efforts were made for settlement of disputes outside the court through negotiation. As a result, 23 litigated companies settled the disputes outside the court and assist of 11 projects were sold through auction during the year. During FY 2004-05, the Bank had written off a total loan liability of Tk. 6155.28 million of 171 projects. Out of which 116 for long term, 52 for bridge and 3 for short term Loan. During FY 2004-05, Loan liabilities of 41 projects were liquidated and 14 new projects were included in the Bank’s loan portfolio. As on 30th June 2005 total loan outstanding of Tk 7441.91 million compared to that of 308 projects luring a total loan outstanding of Tk. 13998.11 million in the preceding year. out of 166 projects in the loan portfolio, 60 were export oriented, 72 import substituting and 34 service (other industries. During Fy 2004-05 total member of frod and allied products projects in the loan portfolio stood at 31 with a total loan outstanding of tk. 491 million. In he preceding year under this sector the total member of projects of the loan portfolio stood at 58 with a total loan outstanding of tk. 1335 million. in Fy 2004-05 total member of projects and total loan outstanding are decreased comparing to the perverse Fy under this Food and Allied products. During FY 2004-05 total number of food and allied products projects in the loan portfolio stood at 31 with a total loan outstanding of Tk. 491 million. In the preceding year under this sector the total member of projects of the loan portfolio stood t 58 with a total loan outstanding of Tk. 1335 million. In FY 2004-05 total number of projects and total loan outstanding are decreased comparing to the previous FY under this Food and Allied products. During FY 2004-05 total members of jute and Allied products projects in the loan portfolio stood at 3 with a total loan outstanding of Tk. 538 million. In the preceding year under this sector the total member of projects of the loan portfolio stood at 5 with a total loan outstanding of Tk. 674 million. In FY 2004-05 the member of projects 2 and loan amount Tk. 136 million are decreased comparing to the FY 2003-04 under this jute and allied products. During FY 200-01 to FY 2004-05 there is decreased trend from previous year. During FY 2000-01 total member of Jute and allied products projects in the loan outstanding of Tk, 930 million, total member of projects 8 and loan outstanding amount Tk. 392 million is decreased comparing to the FY 2004-05 under this jute and allied products. Cotton, woolen and synthetic Textiles. During FY 2004-05 total members of cotton, wooden and synthetic textiles projects in the loan portfolio stood at 53 with a total loan outstanding of Tk. 5304 million. In the preceding year under this sector the total no. of projects of the loan portfolio stood at 87 with a total loan outstanding Tk. 8148 million. In FY 2004-05 the total member of projects 34 and loan outstanding amount Tk. 2844 million are decreased comparing to the financial year 2003-04 under this cotton wooden and synthetic Textiles sectors. During financial year 2001-01 total number of cotton woolen and synthetic Textiles projects in the loan portfolio stood at 122 with a total loan outstanding at Tk. 9314 million. The total member of projects 69 is decreased and loan outstanding Tk. 4010 million is also decreased comparing to the financial year 2004-05 under this cotton woolen and authentic Textiles sectors. During FY 2004-05 total numbers of paper, paper products and printing projects in the loan portfolio stood at 6 with a total loan outstanding of Tk. 177 million. In the preceding year under this sector the total member of projects of the loan portfolio stood at 15 with a total loan outstanding of Tk. 591 million. In FY 2004-05 the total member of projects I and loan outstanding amount 414 million are decreased comparing to the financial year 2003-04 under this paper, paper products and printing sectors. During FY 2004-05 total member of Tannery and leather products projects in the loan portfolio stood at 4 with a loan outstanding of Tk. 100 million. In the preceding year under this sector the total number of projects of the loan portfolio stood at 09 with a total loan outstanding of Tk. 333 million. In FY 2004-05 the total member of projects 5 are decreased and loan outstanding amount 133 million are also decreased comparing to the FY 2005-04 under this Tannery and leather products sectors. During FY 2000-01 total member of Tannery and leather products projects in the loan portfolio stood at 16 with a total loan outstanding of Tk. 657 million. The total member of projects 12 is decreased and loan outstanding amount Tk. 557 million also decreased comparing to the FY 2004-05 under this paper, paper products and printing sectors. During FY 2004-05 total no. of Non-metallic Mineral products projects in the loan portfolio stood at 02 with a total loan outstanding of Tk. 130 million. In the preceding year under this sector the total number of projects of the loan portfolio stood at 4 with a total loan outstanding of Tk. 130 million. In FY 2004-05 the total number at projects 02 and loan outstanding amount Tk. 30 million are decreased comparing to the FY 2003-04 under this non-metallic Mineral products factory. During FY 2000-01 total numbers of Non-metallic Mineral products projects in loan portfolio stood at 0.9 with total loan outstanding of Tk. 380 million. The total number of projects 07 is decreased and loan outstanding amount Tk. 240 million is decreased comparing to the FY 2003-04 under this Non-metallic mineral products sectors. During FY 2004-05 total member of forest and wooden products project in the loan portfolio stood at 1 with a total loan outstanding of Tk. 7 million. In the preceding year under this sector the total no. of projects of the loan portfolio stood at 1 with a total loan outstanding of 7 million which is same to the current FY 2004-05 under this forest and wooden products sectors. During FY 2000-01 total number of forest and wooden products projects in the loan portfolio stood 2 with a total loan outstanding of Tk. 10 million. The total member of projects 1 is decreased and loan outstanding amount Tk. 03 million also decreased comparing to the FY 2004-05 under this forest and wooden products sectors. During FY 2004-05 no loan was sanctioned of Electrical and grounds projects. In the preceding year under this sector the total number of projects of the loan portfolio stood at 6 with a total loan outstanding of TK. 354 million. During FY 2000-01 total numbers of Electrical machinery and goods projects in loan portfolio stood at 10 with a total loan outstanding tk. 386 million. During FY 2004-05 total numbers of machinery and spare parts projects in the loan portfolio stood at 6 with a total loan outstanding of Tk. 190 million. In the preceding year under this sector the total member of projects of the loan portfolio stood at 13 with a total loan outstanding of Tk. 190 million. In FY 2003-04 total number of projects 7 are decreased comparing to the FY 2003-04 under this Machinery and spare parts sectors. During FY 2000-01 total numbers of projects in the loan portfolio stood at 19 with a total loan outstanding of Tk. 234 million. the total number of projects 13 is decreased and loan outstanding amount 189 million is also decreased comparing to the FY 2004-05 under this Machinery and spare parts. During FY 2004-05 total number of service industries projects in the loan portfolio stood at 18 with a total loan outstanding of Tk 209 million. In preceding year under this sector the total number of projects of the loan portfolio stood at 28 with a total loan outstanding of Tk. 422 million. In FY 2003-04 the total numbers of projects 10 are decreased comparing to the FY 2004-05 under this service Industries sectors. During FY 2004-05 total numbers of miscellaneous projects in the loan portfolio stood at 7 with a total loan outstanding of Tk. 96 million. In the preceding year number this sector the total number of projects of the loan portfolio stood at 13 with a total loan outstanding of Tk. 198 million. In FY 2003 the total number of projects 6 are decreased comparing to the FY 2003-04 under this miscellaneous sectors. During FY 2000-01 total member of projects in the loan portfolio stood at 16 with a total loan outstanding of Tk. 214 million. The total number of projects 9 and loan outstanding amount Tk. 118 million is decreased comparing to the FY 2004-05 this miscellaneous sectors. BDBL is one of the prime development financing institutions in Bangladesh to accelerate the pace of industrialization of the country. 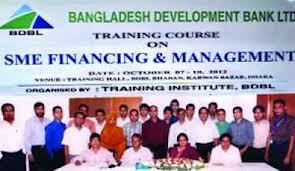 It plays significant role in the industrial development of Bangladesh. As a finance institution it has both strength and weakness. Though, it is said that the contribution of BDBL is below the expectation and it fails to achieve the target, at present BDBL has taken so many development is totally based on Bangladesh Development Bank Limited, so by any means we cannot deny the generous contribution of BDBL in the industrial development sector. Manual of Different departments of BSB. Manual of Project Rehabilitation Department. Loan sanctioning letter of BSB.